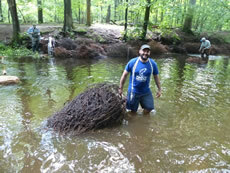 The Mianus Chapter of Trout Unlimited continued their restoration of the Mianus Riverbank by pinning more Christmas trees and adding a hardened access. 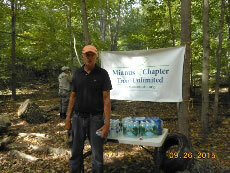 The effort, spearheaded by the Mianus Chapter, took place over the weekend of July 15th. The Friends and the City of Stamford were also contributors. 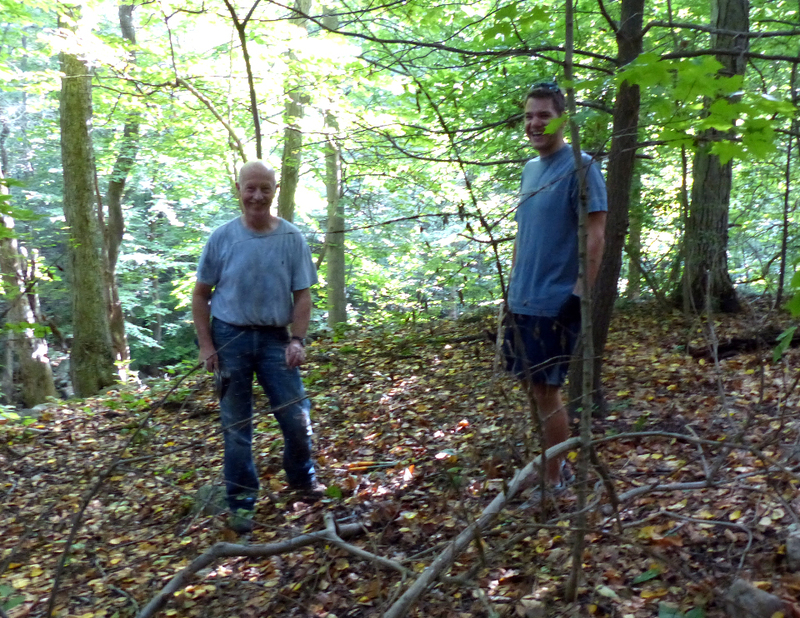 expended by volunteers to restore the riverbank. The Mianus Chapter of Trout Unlimited continued work on the third hardened access. 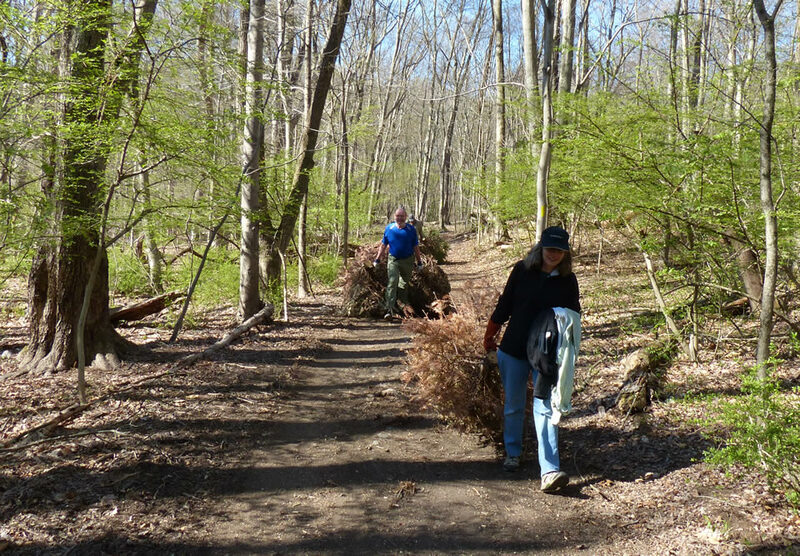 Previously they had built a hardened access and added Christmas trees along the riverbank at a particularly degraded portion of Meander Trail. Last Saturday they put in numerous plants. 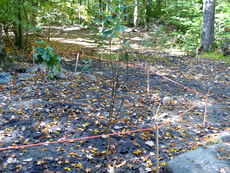 Fencing has been installed temporarily to protect the young plants. 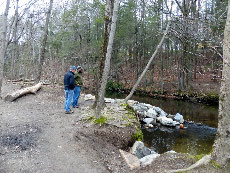 On Sunday, April 24, The Mianus Chapter of Trout Unlimited continued revetment work on the Mianus River. 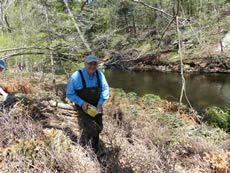 Early April - Jeff Yates of Trout Unlimited continued work on the hardened access on Meander Trail. Trout Unlimited will also be doing more revetment work on the riverbank later in the month. 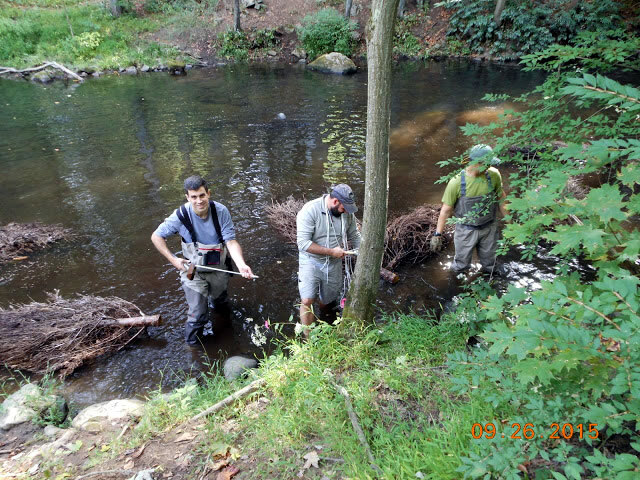 In September, Trout Unlimited and The Friends have plans to do planting alongside the hardened access, the third such access along the Mianus River. 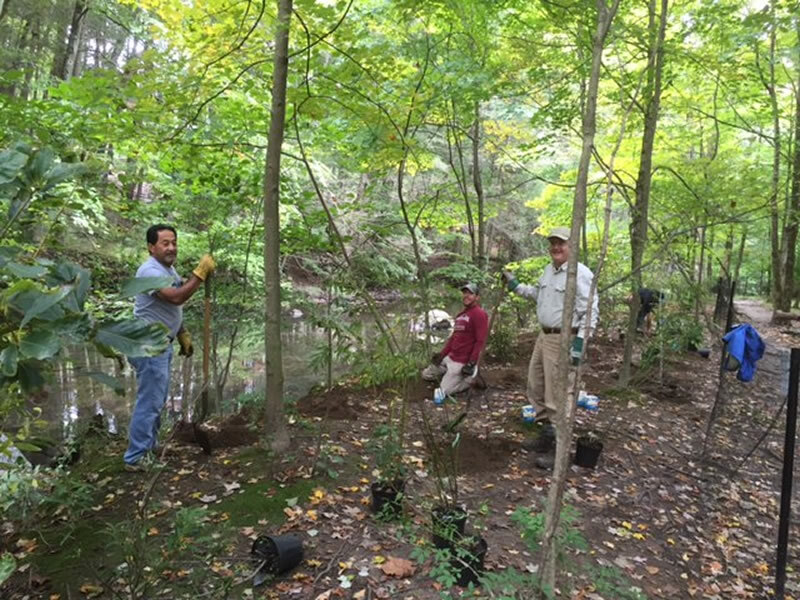 Over the weekend of September 26th and 27th, The Mianus Chapter of Trout Unlimited, in collaboration with the City of Stamford, the Friends of Mianus River park and other organizations provided labor, machinery and volunteer support for the construction of the third hardened access and conifer revetments along the Meander Trail. 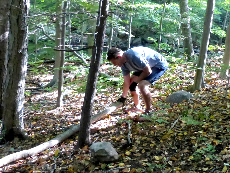 That section of Meander trail was severely eroded (up to 8 feet in three areas). The city paid for the completion of the study to ensure the viability of the restoration plans and helped coordinate necessary approval process. 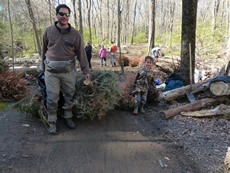 The city also provided the fir trees from last year’s Christmas tree collection. 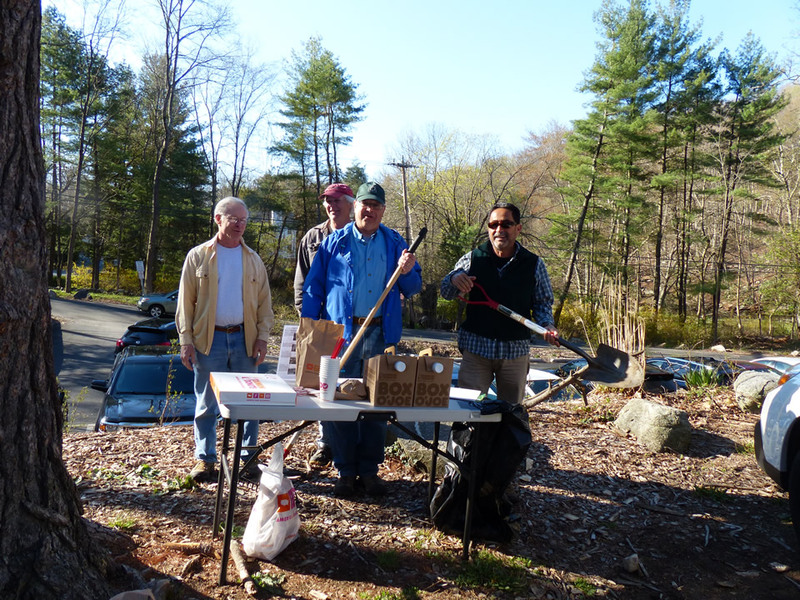 Some of the boulders came from the work in the parking lot at Mianus River and O & G donated additional boulders. Christmas trees were anchored along the riverbank. These conifer revetments will act to narrow the stream channel over time while still allowing of flood plain access. 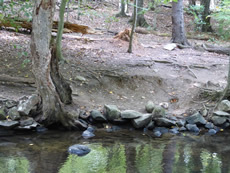 Over time the trees capture sediment and natural debris and restores the river bank. 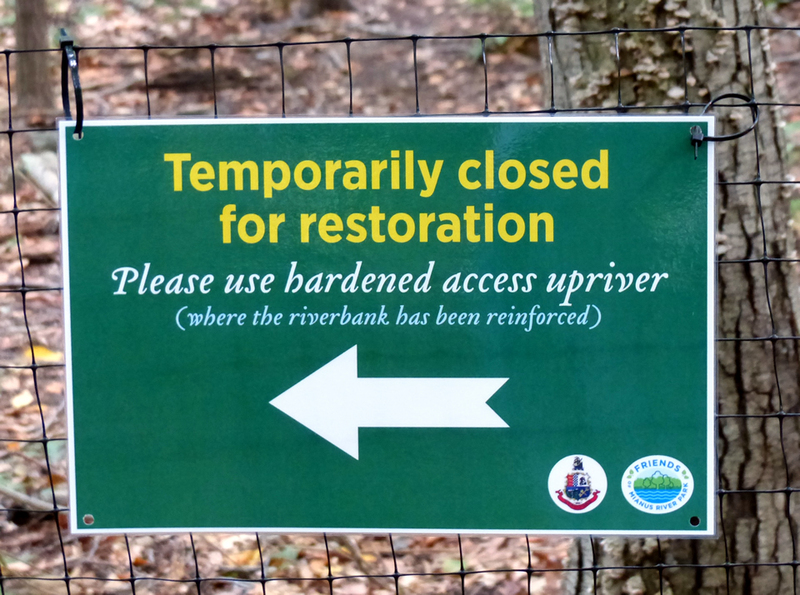 The purpose of the hardened access is to stop the further erosion of the riverbank while providing a secure way to enter the river. The current restoration project is part of a three site project. 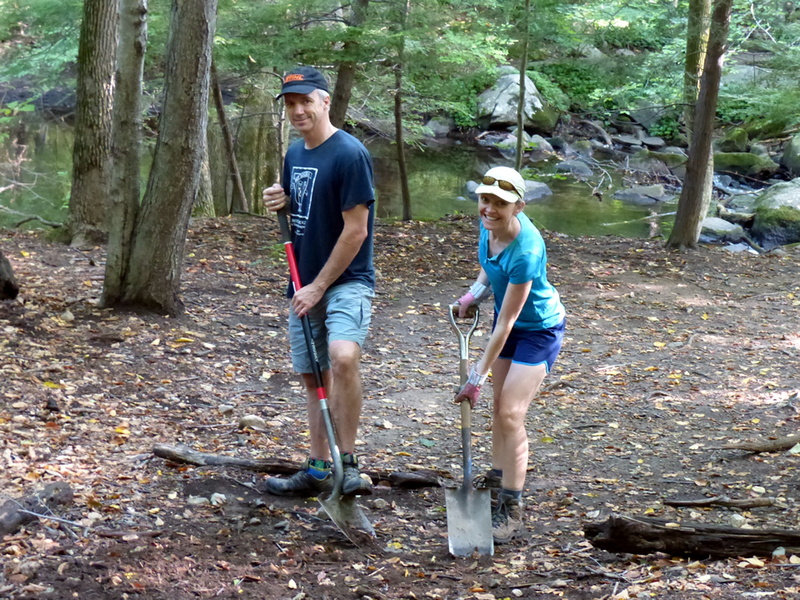 On Saturday, September 12, Friends group volunteers worked on the West River Trail near the Merriebrooke Lane entrance gate. 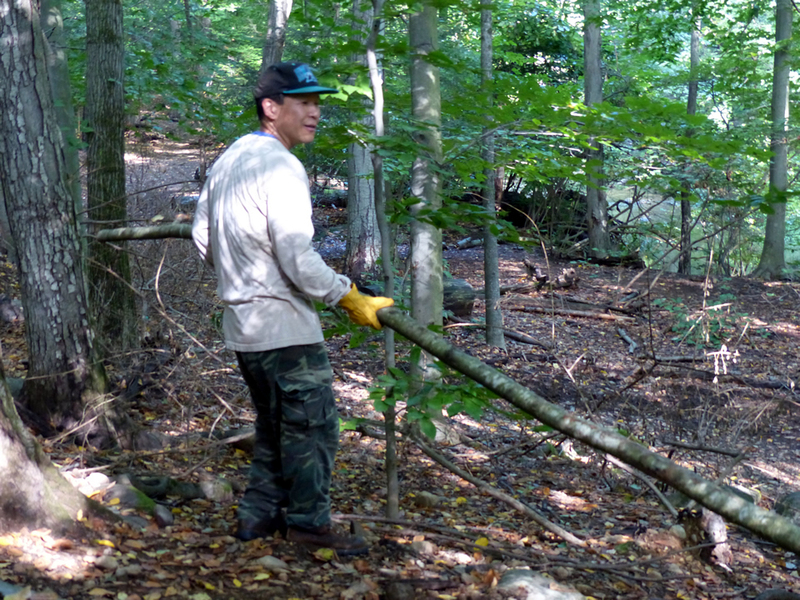 The trail by the gate was rerouted in June this year to make it more sustainable, and this additional work was to close some unofficial trails to the river and break up heavily compacted areas close to the river to help natural recovery. 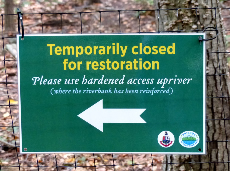 When people and animals enter the river they drag in soil, which causes damage to the river’s ecosystem, and so park users are encouraged to use the rocky hardened access points instead to prevent this from happening. 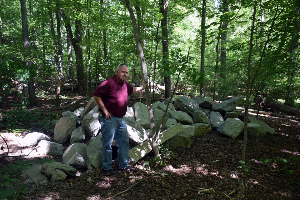 Two of these rock built hardened access area have already been created, one more is planned to be constructed this fall, and others will follow. 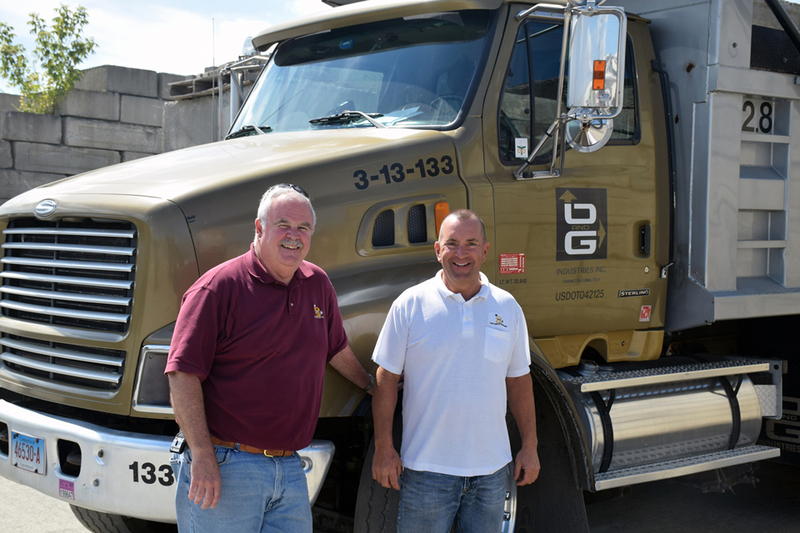 On Thursday, August 27th, O & G Industries delivered the boulders it is donating to help in the next riverbank restoration project which is being spearheaded by the Mianus Chapter of Trout Unlimited, in conjunction with the City of Stamford and The Friends of Mianus River Park. 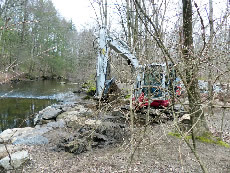 The Fall 2015 project will be the third hardened access project to be done along the Mianus River. 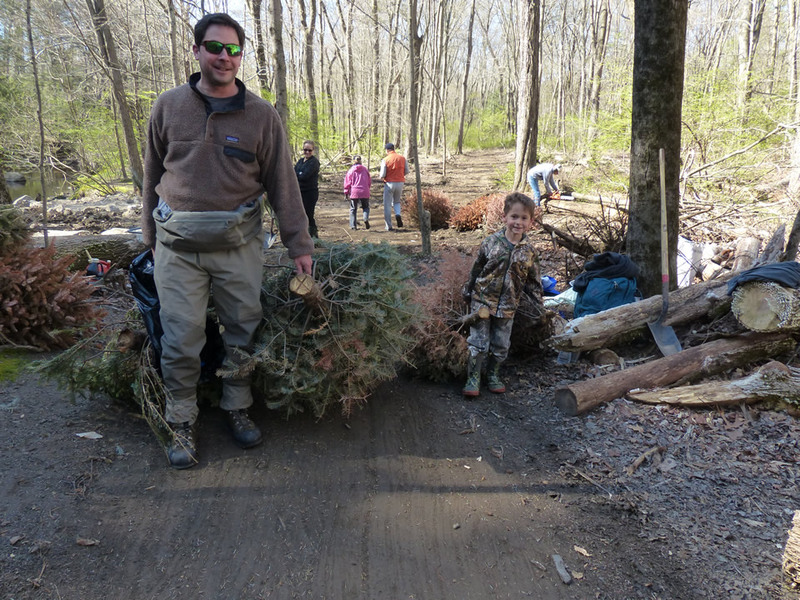 Christmas trees and additional boulders were delivered by the City of Stamford last January. 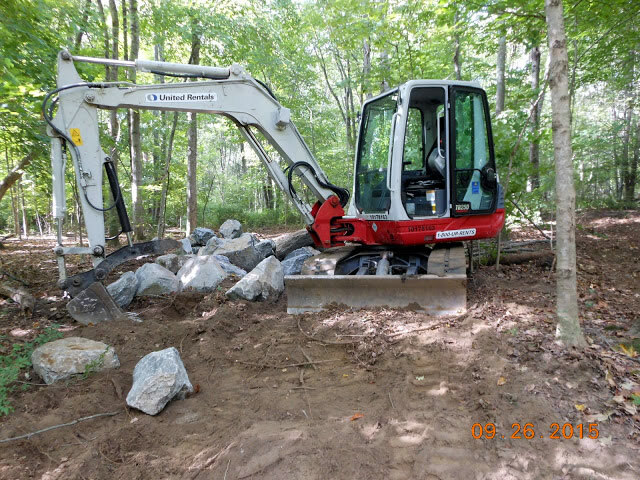 These, together with O&G's donated boulders, will be used to reverse serious riverbank erosion, while maintaining access to the river. 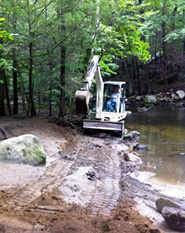 Sept 2012 - Trout Unlimited has completed the riverbank stabilization at a section of the stream know as the Boulder Pool (about 350 yards upstream from the bridge on Merriebrook Lane). It was finished in early September 2012. 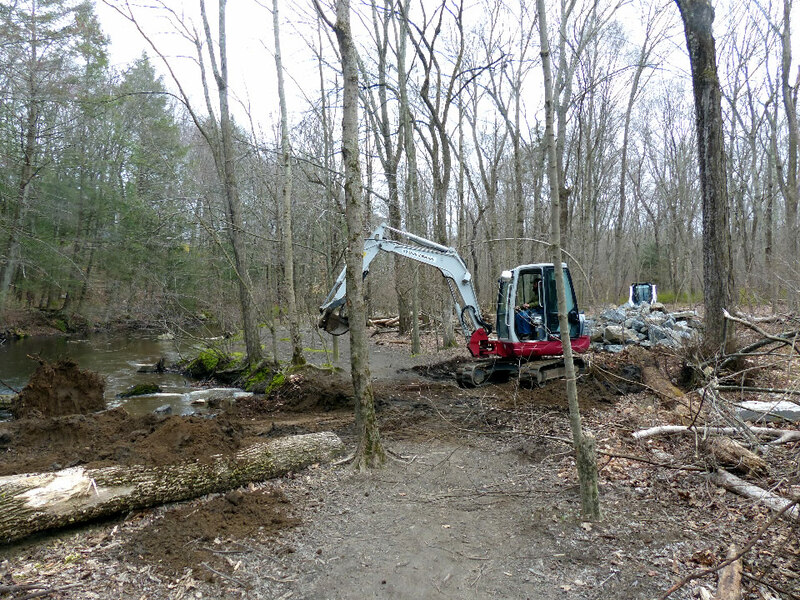 We are grateful to Trout Unlimited for funding the project and Jeff and Tom Yates for coordinating the plans and doing the construction. 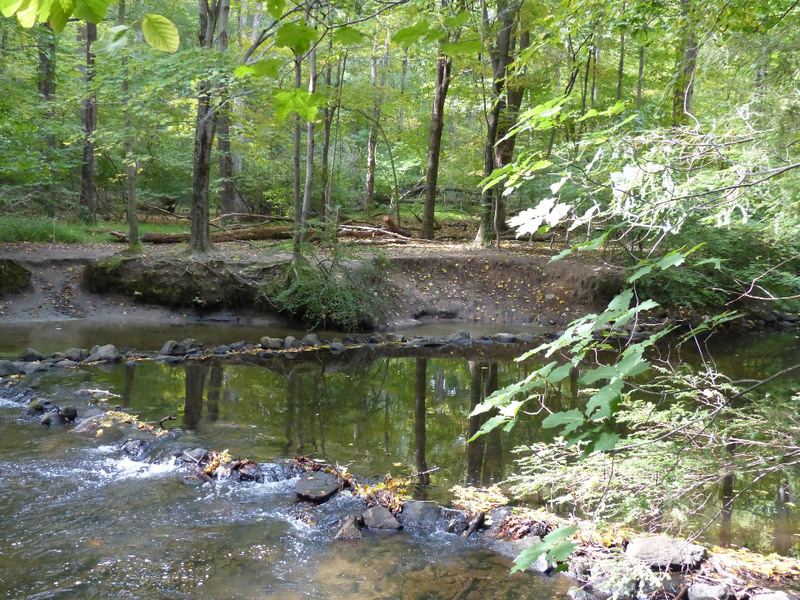 Years of over-use have eroded the riverbank at this location causing the loss of trees and riverbank vegetation. 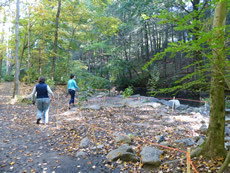 Careful placement of boulders along the edge of the river will stabilize the riverbank and hopefully result in additional depth to this section of the Mianus River. 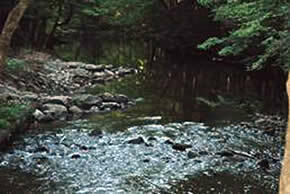 During heavy rainfall, flow will be concentrated in the pool and scour the sand for dispersal downstream. 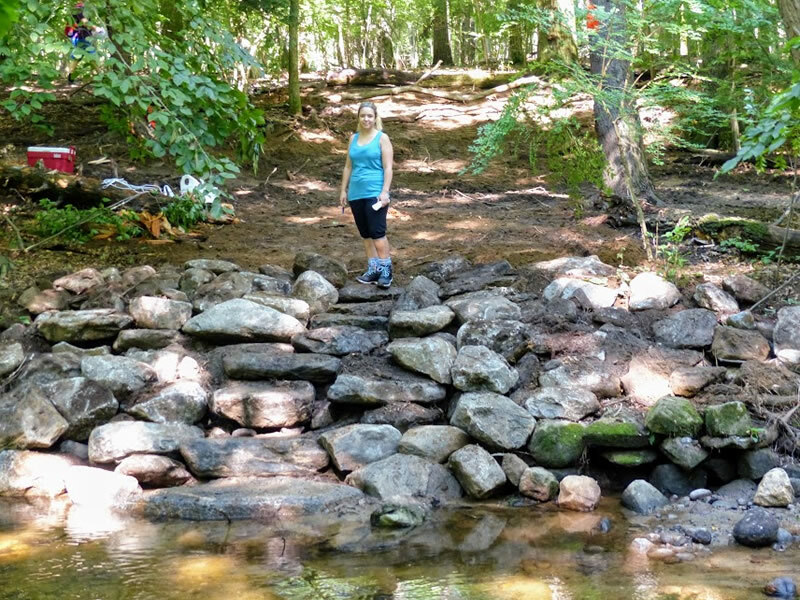 A little sand everywhere along a stream intermingled with larger cobbles, stones and boulders makes a healthier aquatic habitat to support trout. 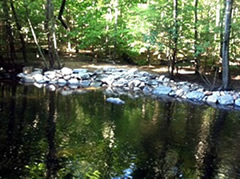 The Boulder Pool project has rejuvenated the river by returning it to a more youthful/younger free-flowing stream. 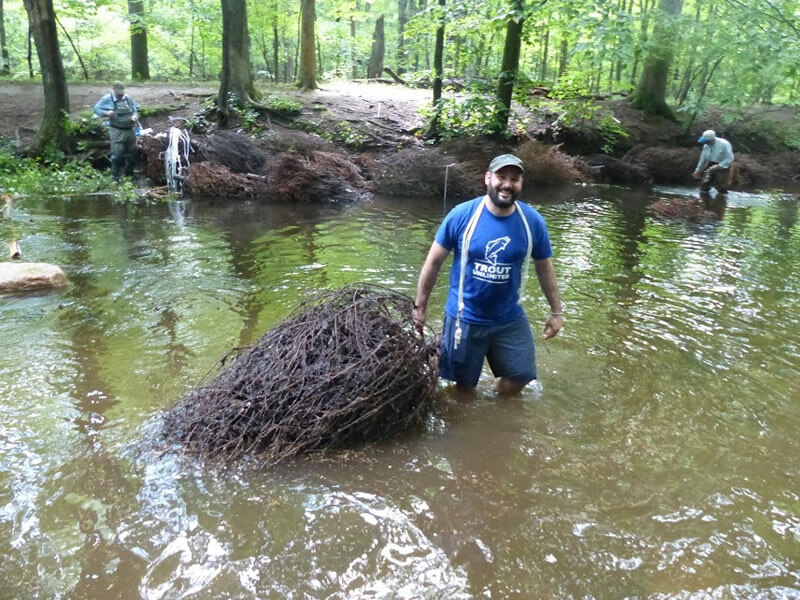 Engineered solutions to rivers are needed when more natural alternatives or behavior modification are not feasible. 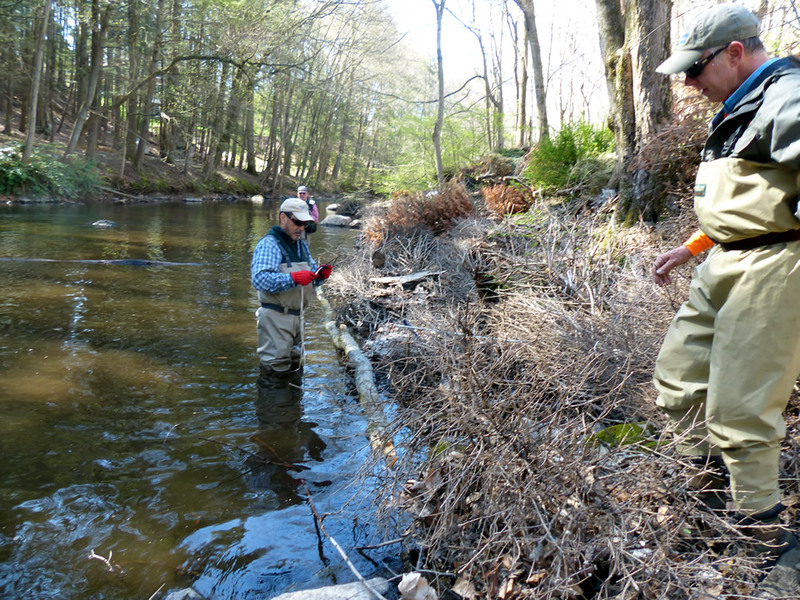 Rest assured that the project was carried out in compliance with environmental permit requirements and according to the requirements of the CT DEEP Fish and Wildlife agency. 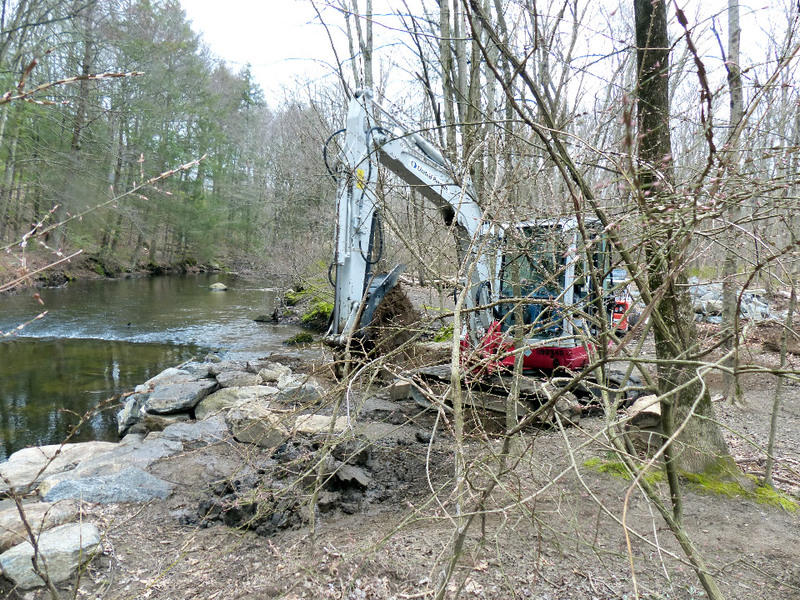 Trout Unlimited has acquired a great deal of experience installing riverbank stabilization projects along nearby Norwalk River. 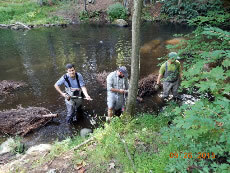 Stream stabilization projects on valuable trout streams like the Mianus are only allowed to be done during late summer to minimize impacts on aquatic habitat. 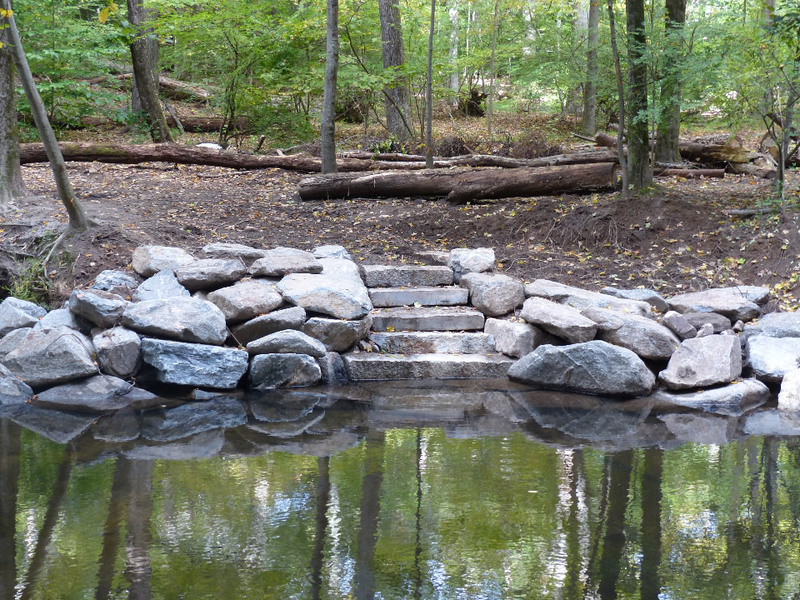 We were fortunate to have dry weather to complete the project and of course indebted to the generosity of Trout Unlimited. 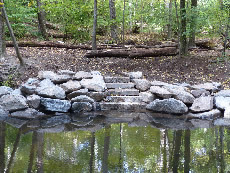 If you have a chance, please visit the Boulder Pool and let us know what you think. 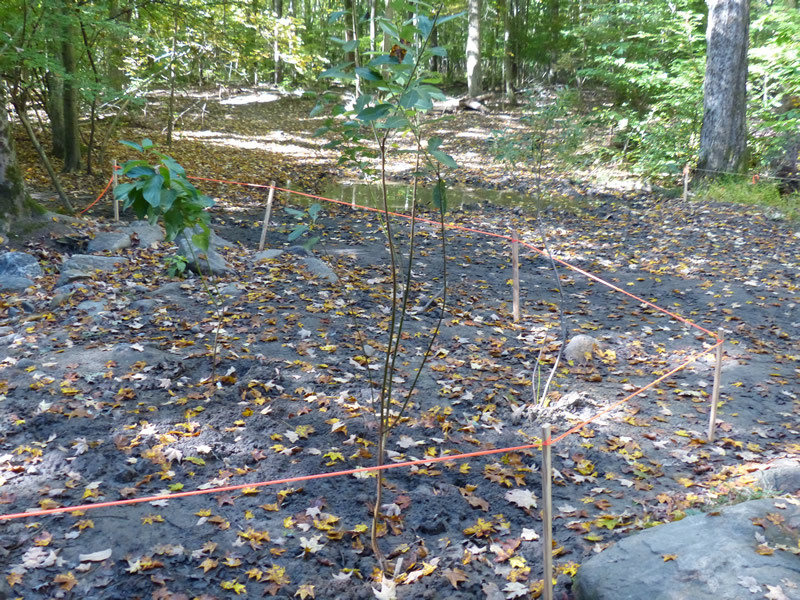 Future plans will include planting native shrubs in the compacted, off-trail areas around the project. 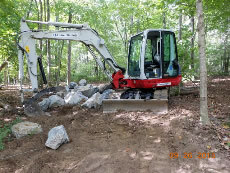 In addition, we plan on narrowing and hardening the new trail, that was created by the heavy equipment, leading from the River Road Trail to the boulders on the riverbank. 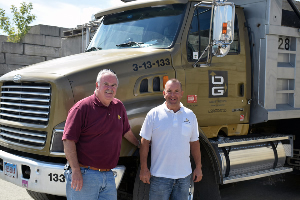 If you'd like to donate time or money to help us pursue more projects like this, visit the Contributions page to find out ways to help. 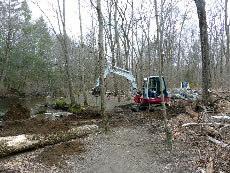 This project is located just south (downstream) of the intersection of the River Road Trail and the Inner Road Trail. (This text and a slideshow of the project can be viewed here). 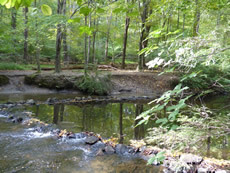 In June 2004, John Monroe of the National Park Service, provided an assessment of sections of the riverbank, that were subject to heavy erosion. 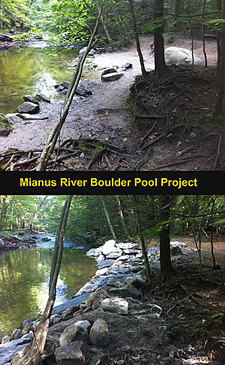 After years of behind-the-scenes collaboration, a Pilot Project for hardening the Mianus River riverbank against erosion by floods and heavy visitor usage, was completed on June 5th, 2010. 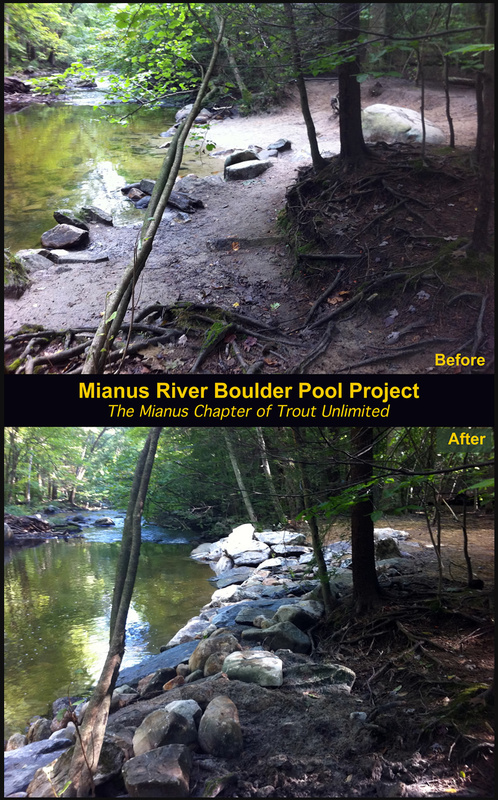 Visit the Mianus Chapter of Trout Unlimited to view their restoration projects. 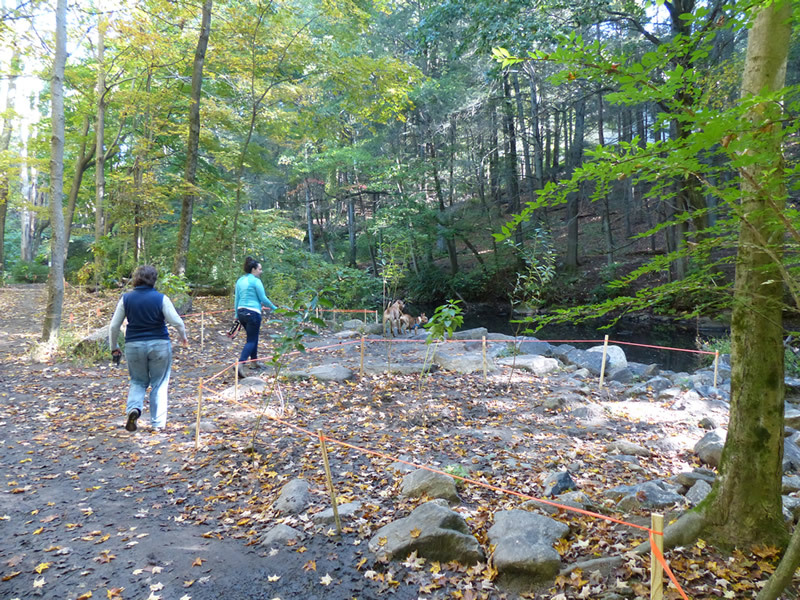 The project began in 2006, with the erection of a deer fence to protect plantings from deer browse and to reduce visitor impact on the riverbank between the deer fence and the river. 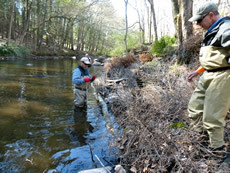 In 2008 the Mianus Chapter of Trout Unlimited (TU) became involved, by planning the Pilot Project just downstream of the deer fence, in an area of the stream heavily damaged by flooding in April 2007. 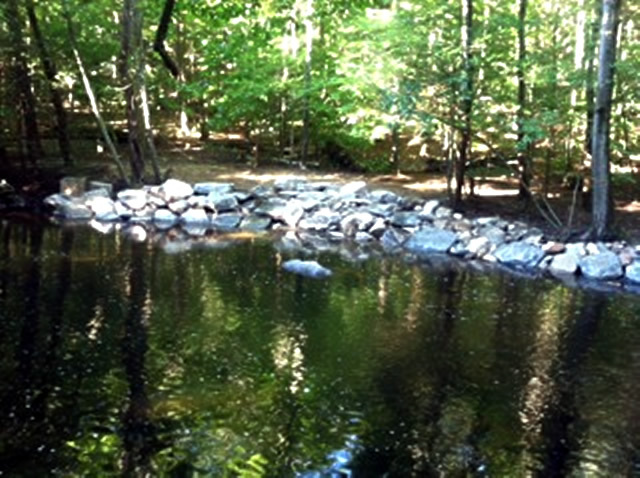 First, the riverbank was built up and reinforced with large rocks. Then, two stone vanes were built into the river. 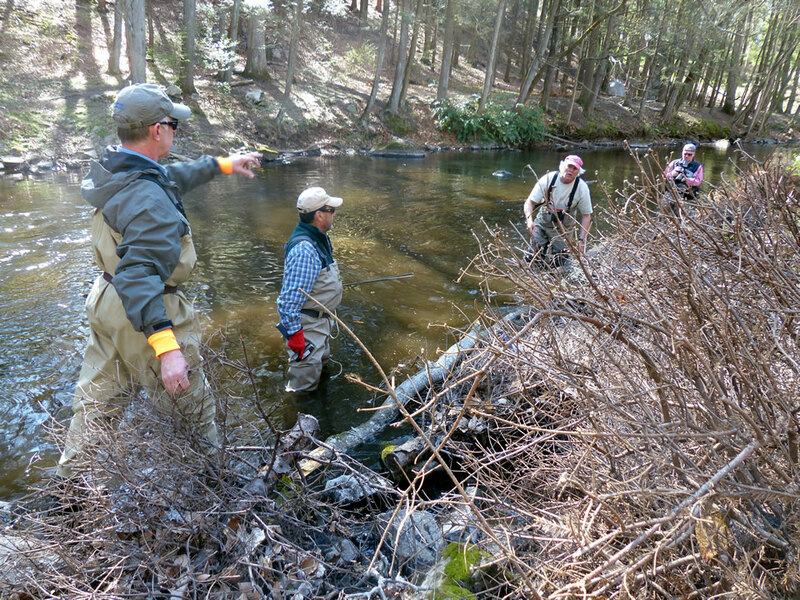 "Two stone vanes jutting into the stream channel on the Mianus River will help prevent further bank erosion while also causing the center of the stream to be scoured out, adding deeper pools which will serve as protective lies for trout." 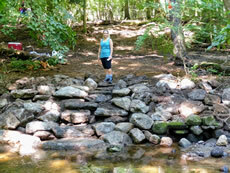 To direct visitor access to the river via the hardened riverbank and the two stone vanes, a rock path was then built from the River Road Trail to the river. 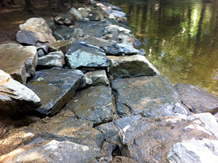 To direct visitors via the hardened rock path to the stone vanes in the river, in order to reduce erosion caused by visitors using un-hardened sections of the riverbank. 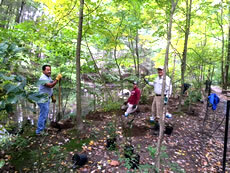 The Pilot Project was finally completed with replanting and fencing of the area immediately south of the rock path, on June 5th, 2010. 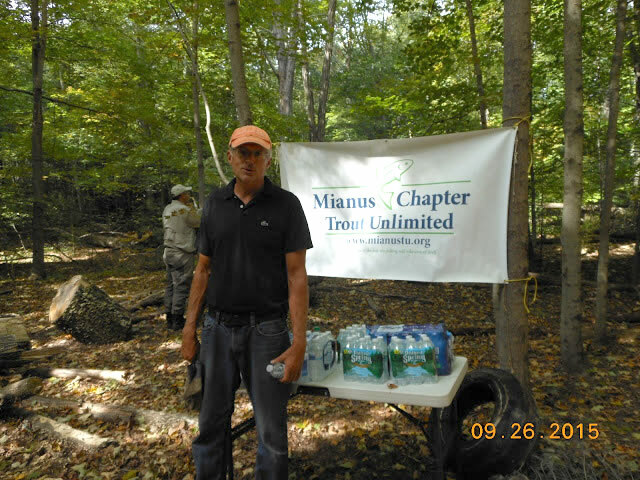 Funding for the construction of the site and the stone vanes, including the plantings inside the downstream deer fence,was donated by the Mianus Chapter of Trout Unlimited. 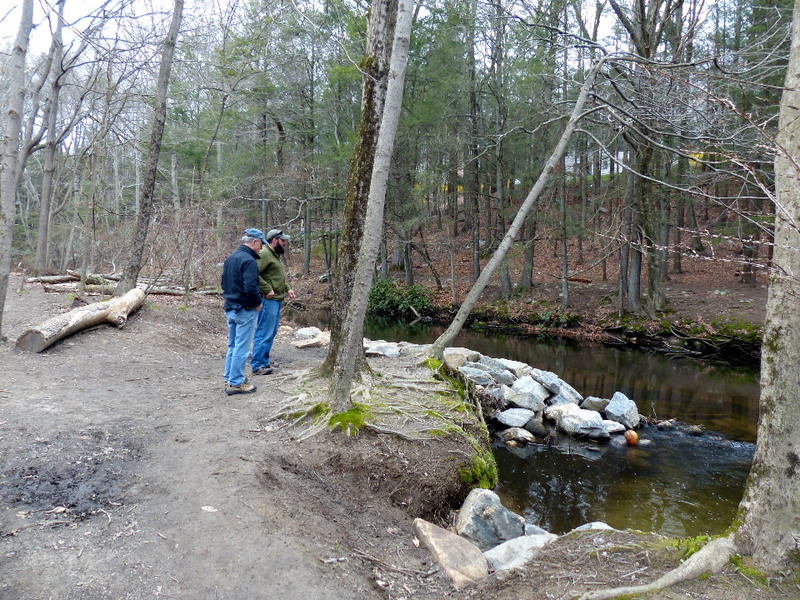 Funding for the downstream deer fence was provided by Greenwich Associates, a local financial consulting firm, which also contributed the labor for erecting the fence and doing the planting, assisted by members of Trout Unlimited and the Friends of the Mianus River Park. 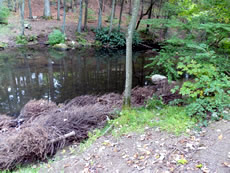 The upstream deer fence and plant material and labor was contributed originally by the City of Stamford; and then on June 2, 2010, plantings and labor were contributed by the Master Gardener program of the Bartlett Arboretum, under the supervision of Sue Sweeney. 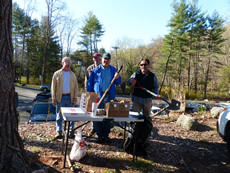 Refreshments for the volunteers, upon completion of the project, was provided by the CT chapter of the New England Mt Biking Association and Greenwich Associates. 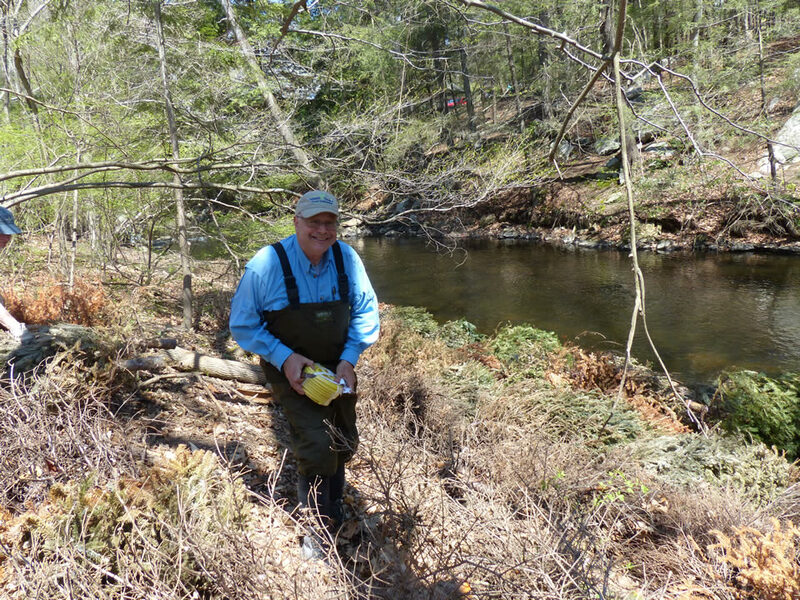 Planning for additional riverbank restoration sites is now underway, with focus on at least two major problem areas.